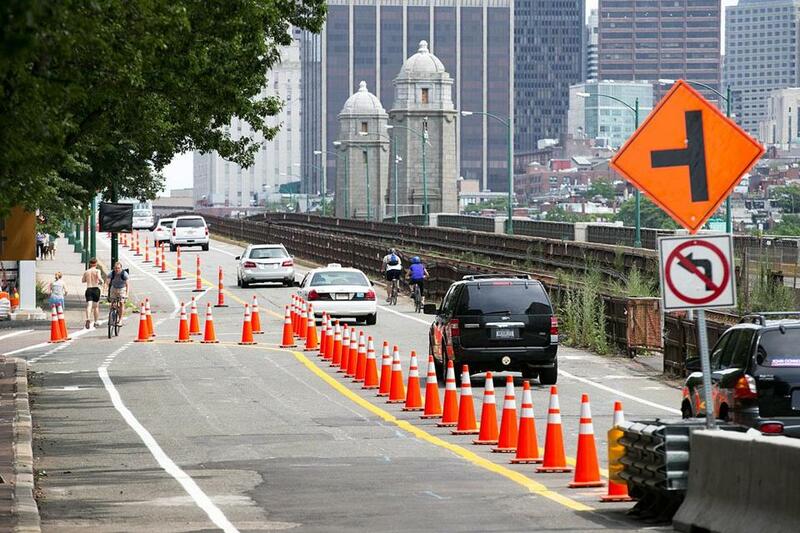 The partial closing of the Longfellow Bridge began Sunday, with traffic into Cambridge barred and Boston-bound vehicles shifted to the opposite lane. Work will take more than three years. Twenty-four hours earlier, things would have gone smoothly. But on Sunday afternoon, the driver of a yellow taxi barreling past the MBTA’s Charles/MGH stop toward the Longfellow Bridge almost ran straight into an obstacle: a line of cars heading straight at him from Cambridge. The taxi driver, a sheepish grin on his face, quickly moved his vehicle into reverse and zipped away past the MBTA station. On the first day of the partial closure of the Longfellow Bridge — no cars allowed from Boston to Cambridge and vehicles coming into Boston directed onto the opposite side of the bridge — there was some confusion but no chaos. The new rules of the road mark the beginning of the 3½-year, $255 million project to rehabilitate the famous span, which was built more than 100 years ago. The project aims to upgrade the bridge’s structure and make repairs to the MBTA tracks that run down its middle. But with such a significant traffic change on a major thoroughfare, the project will not be able to avoid creating headaches for motorists. Three troopers positioned on the Boston side of the Longfellow Sunday gamely guided traffic and responded to perplexed drivers’ queries about how to get across the Charles River. The answer? Take the main detour to the Craigie Bridge, adjacent to the Museum of Science. Signs on the Boston side confused some: Bright-orange LONGFELLOW BR DETOUR placards pointed cars to both the westbound and eastbound sides of Storrow Drive. Both directions offer alternative bridges across the river but some motorists looking at the signs could be seen mouthing expletives, and others said it was disorienting. “There are two signs that say the same thing pointing in different directions,” said a woman in a minivan on Cambridge Street approaching the bridge. Still, the light Sunday traffic flowed smoothly in the late-morning and early-afternoon hours, with no construction work visible and Red Line trains regularly rumbling over the bridge. MBTA service will continue to the Charles/MGH stop throughout most of the construction, but buses will replace trains between the Kendall and Park Street MBTA stations on 25 weekends during the project. Although the new traffic configuration began after midnight Sunday, heavy-duty construction with “destructive work” on the bridge will not start for two weeks, said Michael Verseckes, a spokesman for the Massachusetts Department of Transportation. He added, however, that there would be preparatory construction work during that two-week period. Pedestrians and bicyclists, who were directed on the same single side of the bridge as Boston-bound car traffic, said that for them, the new signs, which included some bright-orange placards with icons of pedestrians and bicyclists, made it easy to know where to cross over the bridge. The signs were “very clear, actually,” said Cheryl Sullivan, who was riding a bicycle from Cambridge to Boston. “Fine for me,” said Somerville resident Chad Lorenz, who walked into Boston over the Longfellow. Pedestrians and bicyclists using the Longfellow Bridge said that for them, the new signs made it easy to know where to cross over the bridge. Motorists heading into the Hub, however, experienced more confusion. On the Cambridge side of the bridge by Kendall Square, there was no police officer to give guidance. The directional signs positioned next to a new fork created by orange cones and Jersey barriers had many drivers slowing their vehicle — some to a complete stop — to consider choices: BOSTON LONGFELLOW BR to the left or MEMORIAL DRIVE WB to the right. Just hours earlier, motorists heading to Boston would have driven on the right side of the bridge, which probably contributed to some of the bafflement on Sunday. “I had no idea which way to go,” said Eric Rhoda, who had just made his way across the Longfellow and was waiting at a traffic light in Boston. “It’s a little confusing when you first get there,” said driver Justin Davies after making his way to Boston. But other drivers said all the signs made sense to them. “Clear,” said Colin Batchelder, sitting in his car after crossing over from Cambridge. But, he added, the construction was likely to add impediments to future commutes headed the other way. “It’s going to make visiting my friends in Cambridge quite difficult,” he said. For some drivers, the confusion was just the cost of doing business in a city long-known for its less-than-clear street grid, puzzling signs, and endless Big Dig detours. “It’s Boston,” Michael A. Francis, who had just driven over the Longfellow, said with a shrug. “We make do,” he said as he drove off, trying to find his way back home to Gloucester amid a sea of orange signs. Joshua Miller can be reached at joshua.miller@globe.com.